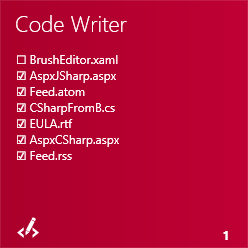 Code Writer v2.1, our free text/code editor app, is now live in the Windows Store. This version focuses on adding full support for new features in Windows 8.1, along with adding some other great updates as well. Are you interested in adding code or text editing abilities to your own Windows Store apps? 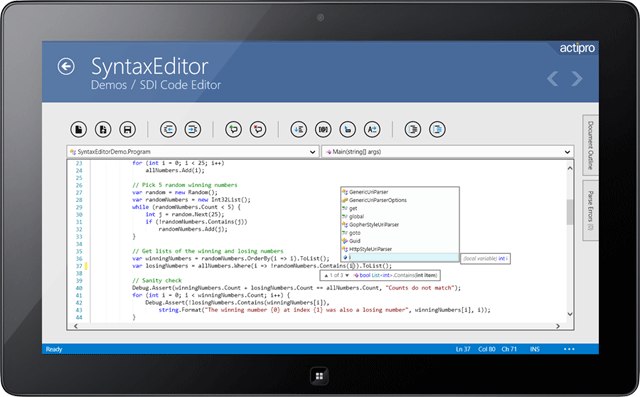 SyntaxEditor for WinRT/XAML was just released, allowing you to build apps just like Code Writer. Download a free evaluation to try it out. We just posted an in-depth blog entry on updates coming to SyntaxEditor that allow for multi-line editing via block selections. These features just launched in the WinRT/XAML version of SyntaxEditor and are part of today's Code Writer release as well. In this screenshot, you can see how a block selection spans multiple lines (it's a selection line after the s in lines on each line) and as I type, the characters appear on each line. Tab (indent), Shift+Tab (outdent), Del (delete next character), Backspace (delete previous character), Shift+Del (delete to next word start), and Shift+Backspace (delete to previous word start) also work. Windows 8.1 allows apps to resize to various small widths, not just the former "snapped" mode width from Windows 8.0. 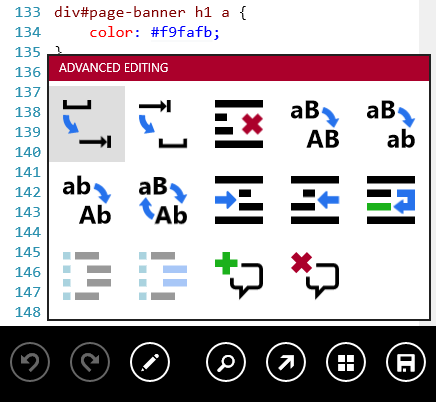 In previous Code Writer versions, the app bars and Advanced Editing gallery were disabled in snapped mode. In the new Code Writer version, the app properly resizes itself and still allows full access to app bars and the gallery. See the screenshot above for an example showing how the app bar buttons collapsed down to a compact size, which still providing app functionality. To help aid in making app bars on various app screens more discoverable, we have added app bar hints to all screens that contain app bars. We've used the standard ellipses indicators and have made them as unobtrusive as possible. Here we see the main Editor screen. Tapping the statusbar area will show the app bar. Here we see the bottom right of the Add Document screen. Tapping the app bar hint will show the app bar. Our live tile implementation tells you all the open documents and whether they have been saved or not. We have added support for the new large live tile size in Windows 8.1. Take a look at this previous blog post that provides more detail on how the live tile works. The new large live tile is capable of displaying up to 18 open document names. Improved image for Windows 8.1 small tile size. codewriter://reset-settings URL restores app settings defaults. Improved the syntax highlighting of PHP code in HTML attributes. Improved all icons to render crisper. Improved the editor's touch-based selection gripper hit testing. Improved the validation of custom file extensions in Settings. Be sure to grab this latest update if you have Windows 8.1. Or if you haven't tried Code Writer yet, go to the Windows Store to download it, and help us by tweeting about the app! The Actipro WinRT XAML Controls 2013.2 have been released and are now ready for download. This version adds a complete port of our SyntaxEditor control and related add-ons, and also adds a number of new controls to existing products. A new WinRT XAML Studio bundle option is available that includes SyntaxEditor, Charts, Micro Charts, and our Shared Library. The pricing saves you 40% over purchasing those products individually! Best of all, once you have an active WinRT XAML Studio subscription, you will receive any new control products added to the bundle for free while your subscription is active. If you are an existing customer of our individual WinRT/XAML controls and would like to switch to studio bundle at a discounted price, please contact our sales team. Our SyntaxEditor control is fully ported and now is available for use in WinRT/XAML apps! This code editor control lets you make any sort of IDE, script, or expression editor app. SyntaxEditor is a powerful text editing control that is packed with features for efficient code editing, including syntax highlighting, code outlining, parsing, line numbers, block selection, IntelliPrompt UI, zooming, adornments, single-line mode, and much more. It is built on top of our next-generation extensible text/parsing framework and has many of the same code editing features found in the Visual Studio code editor. The WinRT/XAML version shares a codebase with the WPF and Silverlight versions of SyntaxEditor, making it easy to transition code between platforms. Now you can build your own apps, just like our free Code Writer app in the Windows Store. The LL(*) Parser Framework is Actipro's own framework for constructing robust text parsers that work standalone or with code editor controls like SyntaxEditor. The framework features grammars that are written in C#/VB using EBNF-like notation, customizable AST construction, advanced error handling/reporting, easy code injection, a complete debugger UI, and much more. The framework is included with the SyntaxEditor control for WinRT/XAML. The SyntaxEditor .NET Languages Add-on is an optional add-on that provides automated IntelliPrompt completion lists, parameter info, quick info, code snippets, code outlining, parsing, AST construction, syntax error reporting, a resolver, formatting, and more for C# and Visual Basic documents. A new pie chart control has been added to complement our other bar, line, area, and scatter chart offerings. 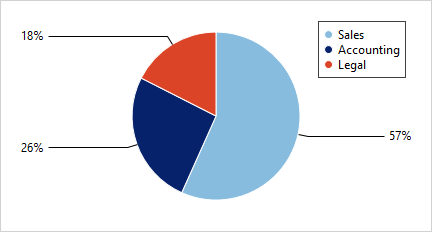 The pie chart supports advanced features like multiple label positioning and display options, legend display, nesting of multiple series, hierarchical data, and more. Donut charts have been added as well. 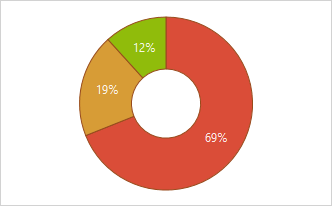 All the same features found in pie charts are found in donut charts, and the hole radius is fully configurable. 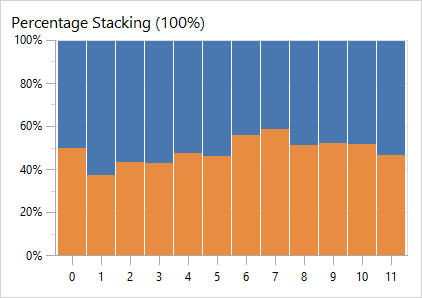 When using stacking bar or area charts with the percentage axis option, the percentage value labels now display on the axis. A new and improved scatter sample has been added. Dark themes are now fully supported out-of-the-box. The XY charts now allow multi-part property paths to be specified in their XPath and YPath binding values. Dark themes are now fully supported out-of-the-box for controls like box plot and candlestick. RadialSlider is a circular slider that can be used to input any scalar value. 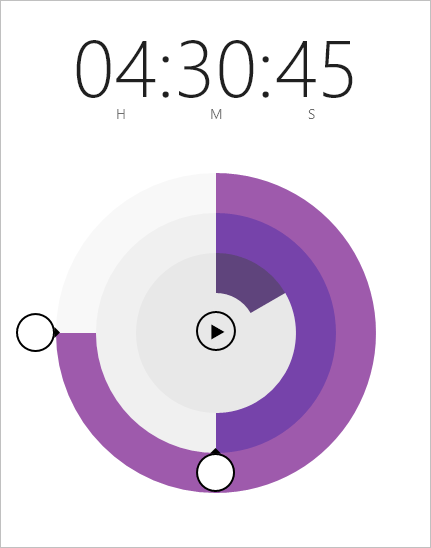 In the example above, a couple RadialSlider and RingSlice controls are combined to build a timer app. RingSlice renders a portion of a ring at designated angles and radius. The slice's start and end angles can be bound to any data and its appearance can be fully customized. 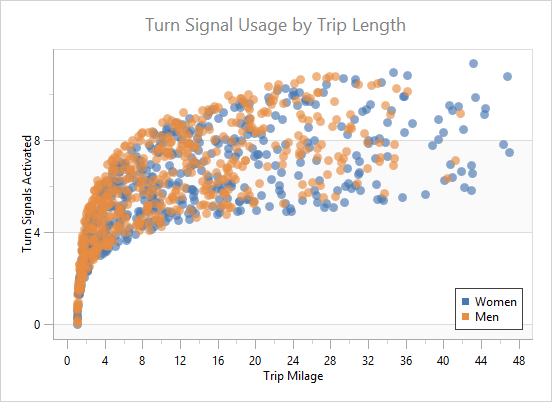 Make dotted lines, add different end cap styles, etc. CircularThumb is a thumb gripper with a circular shape and arrow adornment. It is what the end user interacts with in a RadialSlider, as seen in the screenshot above. We've got an exciting new SyntaxEditor feature to announce that's been desired by a number of customers. And best of all, it's coming to all our supported platforms: WPF, Silverlight, WinRT/XAML (coming very shortly), and WinForms. The new feature is the ability to edit multiple lines when a block selection is active, also known as column editing. First, let's review block selections. Block selection occurs when you hold Shift+Alt and press the arrow keys. For instance if you press the Shift+Alt+Down shortcut a couple times, you create a block selection that in previous versions would end up selecting the entire three lines since its selection was zero-width (no real characters were selected). If you then pressed Shift+Alt+Right, it would make a rectangular selection that is three lines tall and one character wide. At this point you could extend the selection further and then copy it, move to a new location in the document, paste it, and the entire block would be pasted in place there. This is a very handy editing feature in some scenarios. In the next SyntaxEditor releases, we have altered how things work when you have the zero-width block selection. Again this is the scenario where you start with no selection and press Shift+Alt+Down a couple times. In the updated code, we now no longer show selection over all the lines and instead, render a thin line that displays where the block selection is. In the screenshot above, you can see the blue lines that indicate the location of the zero-width block selection. If we extend the block selection to the right, it become a rectangle that covers the class attributes. We now can delete that by pressing Del. Now let's get onto a demonstration of the new features coming for multi-line editing. Again, I've created a zero-width block selection and now I'll start typing. I've typed in the div tag again but I only did it once. It automatically entered the characters I typed on each line that was part of the zero-width block selection. That's pretty neat! The last character I typed (a >) is now gone in all three lines. These sorts for multi-line editing features can really help increase productivity in a number of editing scenarios. They will be included in the next releases of our WPF, Silverlight, and WinForms controls. And they will be included in the upcoming WinRT version of SyntaxEditor as well. WPF Controls 2013.1 build 591 has been released and is now available for download. This build focuses on minor enhancements and bug fixes. Silverlight Controls 2013.1 build 161 has been released and is now available for download. This build focuses on minor enhancements and bug fixes.